Abstract: The surgical outcome of orbital cavernous hemangiomas has been reported either by ophthalmologists, who preferred anterior approach, or by neurosurgeons, who favored transcranial approach. In this series, we reported the surgical outcome of ten patients with orbital cavernous hemangioma. The clinical findings varied from obvious axial proptosis in all patients (100%), visual impairment (60%), limited ocular movement (50%), and orbital pain (60%). The surgical outcomes were determined at their last follow-up and examination, where 80% of the cases had a good outcome, one patient had permanent visual damage and partial ptosis (poor), and another patient had an unchanged visual function (fair). 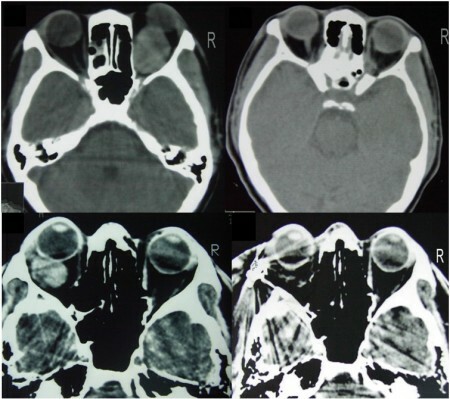 Transcranial approach is still an appropriate surgical approach for most orbital cavernous hemangioma with good and acceptable surgical outcomes. Generally, lateral orbitotomy is indicated for a lesion located at the lateral compartment of the orbit that does not affect orbital apex.